I doubt the sign is still there, but the thought is more profound than it may seem at first blush. Beware because you are about to read something that might disturb you just as the DMV sign caused some people to sneer while others, like me laughed. 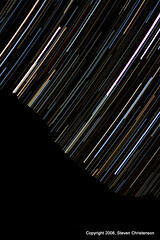 Pictures of star trails (like the one at left) are BORING. Ho Hum. Yes, taking star trail photos is technically a bit challenging. And it is also interesting – for a short while – to the photographer and even friends of the photographer. But really, what do you have? White, and sometimes colored lines across a frame. 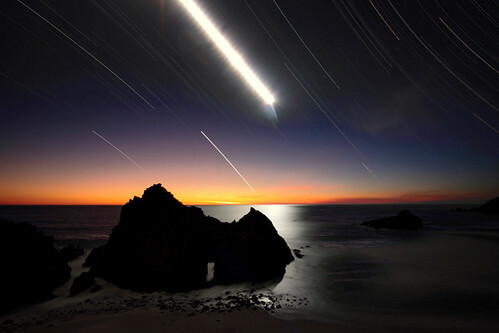 It’s the KNOWING that those are stars and the photo represents time that starts the mind in motion. I may form a strong emotional connection to a photo of my cat but that does not mean it’s a good picture. It means I have a strong bond to MY cat. Something compelling and visual must be present for my cat photo to be interesting to someone else. (PS I don’t have a cat – my wife is allergic to them). To me, a star trail must attach earth and sky, tell a story, suggest something of wonder or awe or longing. That is why for the better part of 2 years I’ve been collecting star trails in a gallery on Flickr called “The Best of Star Trails.” I am the primary judge of what makes it in to the photo pool so the photos reflect my opinion. But if you look through those photos you should notice something. Actually two things. Almost every image has more than lines in the sky – there is also light on something in the foreground. Most of the images would be interesting even if there were no stars or star trails at all. I have never set out to capture a star trail where the sole goal was a star trail. I always attempt to marry an interesting foreground with the sky. The more interesting the foreground, the more interesting the photo, at least that’s the way I see it. Don’t “center” the circle of a circular star trail. Leave it off to the left or right to strengthen an image (e.g. like the rule of thirds). Leave some breathing space around the center point. This usually means super wide angle lens unless you are shooting at a low latitude. 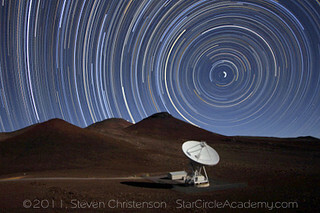 It doesn’t have to be a circular star trail to be interesting! The moon can be your friend. Mauna Kea, Hawaii, moonlit, 7 hours of exposures. What about you? 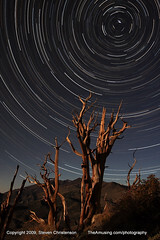 What makes a star trail shot interesting to you? Please comment, we’d love to hear from you. Red Rock Canyon State Park, California. The star trails are dense because a very high ISO was used. 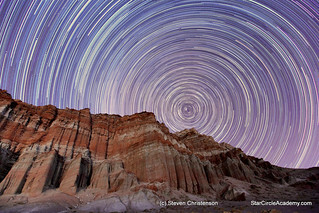 This entry was posted in Astrophotography, Creativity, Image, Photo Tip, Stacking and tagged boring, creativity, foreground, IMHO, improving, interest, less boring, Star Trails on September 8, 2012 by Steven Christenson.